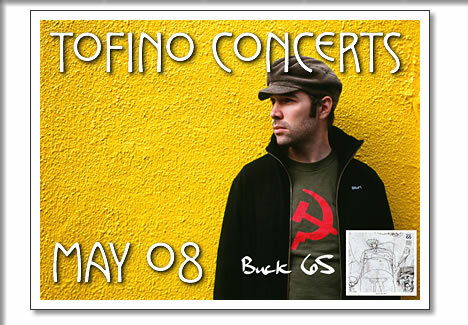 The following concerts in Tofino are happening in the month of May 2008. Tickets are available at Tofitian, Long Beach Market (Esso) and at the Common Loaf. Richard Terfry, better known as Buck 65, is a Canadian hip hop artist, MC and turntablist. However he has recently moved away from hip hop in a stylistic context, and moving closer to blues, country, rock, folk and avant garde genres. That said, his new direction is seemingly still underpinned by an extensive background in abstract hip hop, his trademark rhyme-phrasing and lyrical aspiration evident in the altered timbre vocal delivery displayed in his more recent releases. Terfry is also a host at CBC Radio 3, with hosting a program on the CBC Radio 3 website's web radio station during weekdays. Sweatshop Union is not just a hip hop group with diverse vocal styles and crisp, soulful beats--they are the breath of fresh air that hip hop fans have been waiting for. Originally operating as four independent units (Kyprios, Dirty Circus, Creative Minds, and Innocent Bystanders), the Sweatshop Union Collective came together to offer an alternative to the seemingly repetitive, negative-natured release of rap music. Hey Oceans mellow guitar grooves, eargasmic vocals, and upbeat jazzy licks keep listeners comfortably sitting, standing, or dancing, while they are washed out to sea and carefully brought back to shore. Passionate voices, pensive words, and frivolous fun keep this music honest and pure: from the heart, for the soul. The quartet draws on influences from folk, reggae, funk, jazz, rock, hip hop, and more delivering finely crafted pop and funky freeform jams. Their music also borrows from several world music genres; due to the band members travels in Central America, Nepal, China and Europe.